A mix of sun and cloud. Fog patches dissipating this morning. High 6 except temperature steady near plus 2 along the coast. UV index 7 or high. Becoming cloudy this evening then periods of snow. Snow mixed with ice pellets overnight. Snow and ice pellet amount 2 cm. Wind becoming east 20 km/h gusting to 40 near midnight. Low zero. Periods of snow. Snow mixed with ice pellets in the morning. Rain along the coast in the afternoon. Snow and ice pellet amount 2 cm. Wind northeast 30 km/h gusting to 50. High plus 2. Nationwide, you can view weather on CBC News Network, 7 days a week. 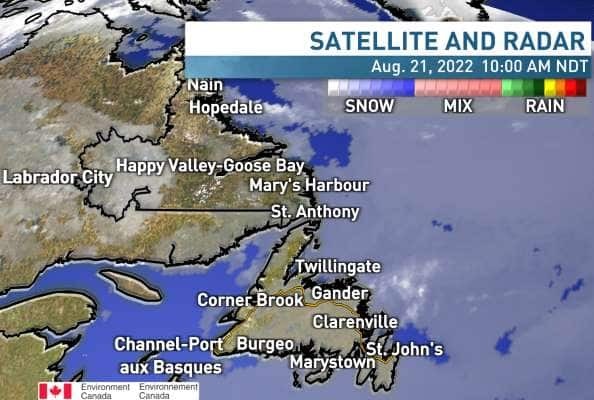 Don't forget, your local weather forecast is available in your area on the CBC regional nightly news. Tune in for weather: regional, national and international, coming your way from our team of meteorologists!